Energy Cleansing or Clearing is often thought of as a method that eradicates energy. However, according to scientific quantum theory, energy can be neither created nor eradicated...it can only be transformed. Therefore, the term "energy cleansing" or "energy clearing" are a misnomer. In reality, we can transform or realign energy through the frequency and vibration of another energy, and infuse it with personal intentions. This has been done for millennia. From early on, humans have been using smoke, fire, and water to cleanse or transform energy. Religious rites are rich with these cleansing rituals. Priest's use water, fire, and smoke. Sound is also effective in transforming energy through frequency. The ritual use of drums, flutes, bells, chimes, gongs, chants, singing, and other verbalization is common throughout the world and the ages. The use of earth elements such as stones, minerals, and gems is also a common practice. The earth element such as quartz has been used to "ground" or amplify energy in indigenous healing rituals. The use of foliage, herbs, and oils from plants is common both as an antibacterial agent and an aromatic. Every element that is used in the practice of traditional Chinese Feng Shui to bring the man-made environment into harmony is included in these methods: Fire, Earth, Metal, Water, and Wood. As a classically trained Feng Shui practitioner I use all of these to help transform, realign, and reset the energy in a space, object, or personal aura. The vibration and frequency of these natural elements interact with the existing energetic pattern of a space, object, or person, and begins to re-order their vibrations through that interaction. In conjunction with these elements, projecting personal energy and the energy of mindfulness are used to transform and ultimately "reset" the energy to a supportive, personalized state. The reason for doing this is that energy can become "muddy" or "clouded" by the interaction of emotions, events, objects, or from the simple passage of time. This is referred to a "historical energy." If left in a vacuum, energy would remain largely unchanged, but once an energetic being or object associated with the energy of a space or other objects, the vibration begins to change...similar to how a diamond is formed. If the people and events are at a high frequency, the overall vibration will remain high. But once lower frequencies are introduced, the energy will begin to change. Low frequencies may include sadness, fear, depression, stress, anxiety, anger, etc. To realign or "reset" the vibration of a space or object to a higher frequency, I first completely "ground" and focus my attention on the higher frequency vibrations I want to infuse into the object or space. I begin with sound frequency, to begin moving the vibration of the energy. Among other tools, I use a crystal singing bowl that is attuned to the heart chakra...in the key of F. It activates my heart chakra, expanding its influence into a space. At the same time, I begin to infuse mindful intentions for love, prosperity, and health. 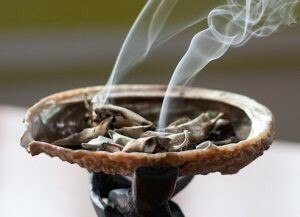 This is followed by smudging to further infuse the space with a cleansing energy. This is followed by a "sealing" blessing and a spritz of essential oils mixed with distilled water and infused with crystals. When I complete an energetic realignment of a space I've been told by my clients that they see and feel a "lightness" to the space. They feel buoyed by the energy in the space. Short of a professional realignment, there are things you can do to help keep the vibration higher in your home or office. Salt lamps infuse the energy of the space with negative ions, transforming the vibration to a very high level. You can use simple methods such as burning incense and playing uplifting music. Open doors and windows to allow a flow of fresh air into your space. Not only will it provide an infusion of fresh energy, but it will help clear and improve the indoor air quality. Personal energetic cleansing can be accomplished by soaking in a detoxifying and relaxing tub infused with sea salt & essential oils. Light candles and play some soothing music and enjoy the benefits of realigning your energetic aura. If you don't have a tub, try a shower with sea salt, Epsom salt, or baking soda mixed with essential oils. Another way of tending to your personal aura is through meditation. A chakra alignment meditation will leave you clear-headed and feeling buoyant. Yoga or rhythmic exercise (running, swimming, etc) are also a good way to "reset" your energetic vibration from the endorphin flush while you're engaged in focused movement. Don't overlook the objects that you bring into your home. Everything has energy attached to it. Whether it's the energy of the manufacturing method, materials, or the hands that have handled it. Historic energy attaches to everything so it's a good idea to "clear" it before you bring it into your home. The same is true for the energy you bring into your home from work or other experiences. Take a moment to ground and energetically realign yourself before you walk into the door, especially if you work in a high stress or unhealthy environment. I had a question about why a nurse was experiencing such sadness at home. When I mentioned the idea of releasing the energy of her work from her aura before she went home every night, she completely understood that she was literally taking her work home with her. Even though she loved her work she was dealing with physically, emotionally, and mentally broken people all day. For a personalized spatial healing & realignment, contact me for more details and to schedule an appointment for a site visit.